The present U.S. military organizational structure is a result of the National Security Act of 1947. This is the same act that created the United States Air Force and restructured the War Department into the Department of Defense. The Department of Defense is headed by a civilian, the Secretary of Defense, who is appointed by the President of the United States and approved by the Senate. Under the Secretary of Defense, there are three military departments: The Department of the Army, the Department of the Air Force, and the Department of the Navy. Each of these military departments is also headed up by a civilian service secretary, who are also appointed by the president. 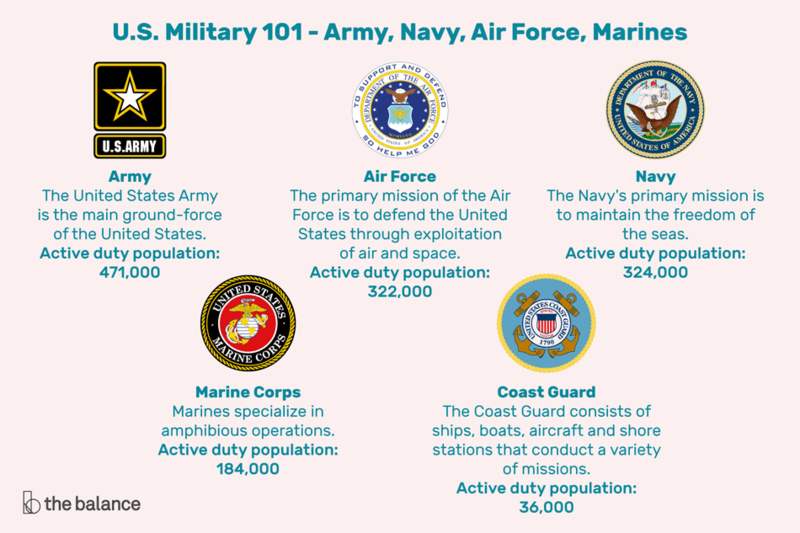 There are five military branches: The Army, Air Force, Navy, Marine Corps, and Coast Guard. The Army is commanded by a four-star general, known as the Army Chief of Staff. The top military member in the Air Force is the Air Force Chief of Staff. The Navy is commanded by a four-star admiral, called the Chief of Naval Operations. The Marines are commanded by a 4-star general called the Commandant of the Marine Corps. While the chiefs of staff of the Army and Air Force report to their respective cabinet secretaries for most matters, both the Chief of Naval Operations and the Marine Corps Commandant report (for most matters) to the Secretary of the Navy. So yes, the Marine Corps is technically part of the Navy. These four flag officers also make up a group called the Joint Chiefs of Staff (JSC), which also includes the Vice Chairman and Chairman of the Joint Chiefs of Staff. The Chairman is nominated by the President and approved by the Senate (as are other general and flag officer positions). For operational matters (such as war or conflict), the Joint Chiefs bypasses the individual service secretaries and report directly to the Secretary of Defense and the President. The Army is the main ground-force of the United States. Its primary function is to protect and defend the country and its interests with ground troops, armor (such as tanks), artillery, attack helicopters, tactical nuclear weapons, and other weapons. The Army is the oldest U.S. military service, officially established by the Continental Congress on June 14, 1775. It’s also the largest of the military services. The Army is supported by two Reserve Forces which can be tapped for trained personnel and equipment during times of need: The Army Reserves, and the Army National Guard. The primary difference between the two is that the Reserves are owned and managed by the federal government, and each state owns its own National Guard. However, the president or the Secretary of Defense can activate state National Guard members into federal military service during times of need. The Air Force is the youngest military service. Prior to 1947, the Air Force was a separate Corps of the Army. The primary mission of the Army Air Corps was to support Army ground forces. However, World War II showed that air power had much more potential than simply supporting ground troops, so the Air Force was established as a separate service. The primary mission of the Air Force is to defend the U.S. and its interests via air and space. It operates fighter aircraft, tanker aircraft, light and heavy bomber aircraft, transport aircraft, and helicopters. The Air Force is also responsible for all military satellites and controls strategic nuclear ballistic missiles. Like the Army, the active duty Air Force is supplemented by the Air Force Reserves and the Air National Guard. Like the Army, the Navy was officially established by the Continental Congress in 1775. The Navy's primary mission is to maintain and protect U.S. interests at sea. In times of conflict, the Navy helps to supplement Air Force air power, since Navy aircraft carriers can often deploy to areas where fixed runways are impossible. An aircraft carrier usually carries about 80 aircraft, mostly fighters or fighter-bombers. Navy ships can attack land targets from miles away with very heavy guns and cruise missiles. Navy submarines allow stealth attacks on our enemies from right off their shores. Marines specialize in amphibious operations; their primary specialty is to assault, capture, and control beachheads, which then provide a route to attack the enemy from almost any direction. The Marines were officially established on 10 November 1775 by the Continental Congress to act as a landing force for the United States Navy. In 1798, however, Congress established the Marine Corps as a separate service. While amphibious operations are their primary specialty, in recent years, the Marines have expanded other ground-combat operations, as well. For combat operations, the Marine Corps likes to be self-sufficient, so it also has its own air power, consisting primarily of fighter and fighter/bomber aircraft and attack helicopters. But the Marines do use the Navy for logistical and administrative support; there are no doctors, nurses, or enlisted medics in the Marine Corps, for instance. Even medics that accompany the Marines into combat are specially-trained Navy medics. The United States Coast Guard, the smallest of all the U.S. military branches, was originally established as the Revenue Cutter Service in 1790. In 1915, it was reformed as the United States Coast Guard, under the Treasury Department. In 1967, the Coast Guard was transferred to the Department of Transportation. Legislation passed in 2002 transferred the Coast Guard to the Department of Homeland Security. In peacetime, the Coast Guard is primarily concerned with law enforcement, boating safety, sea rescue, and illegal immigration control. However, the president can transfer part or all of the Coast Guard to the Department of the Navy in times of conflict. The Coast Guard consists of ships, boats, aircraft and shore stations that conduct a variety of missions. It is also supported by the Coast Guard Reserves, and a volunteer Coast Guard Auxiliary in times of need. The Coast Guard is commanded by a four-star admiral, known as the Coast Guard Commandant. Enlisted members perform the primary jobs that need to be done, trained to perform specific specialties in the military. As enlisted personnel progress up the nine ranks, they assume more responsibility and provide direct supervision to their subordinates. Enlisted personnel in certain grades have special status. In the Army, Air Force, and Marine Corps, this status is known as Non-Commissioned Officer status, or NCO. In the Navy and Coast Guard, such enlisted are known as Petty Officers. In the Marine Corps, NCO status begins at the grade of E-4 (Corporal). In the Army and Air Force, enlisted personnel in the grades of E-5 through E-9 are NCOs. However, some Army E-4s are laterally promoted to corporal and are considered NCOs. Also in the Army and Air Force, personnel in the grades of E-7 to E-9 are known as senior NCOs. In the Marine Corps, those in the grades of E-6 through E-9 are known as staff NCOs. In the Navy/Coast Guard, petty officers are those in the grades of E-4 through E-9. Those in the grades of E-7 to E-9 are known as chief petty officers. Warrant Officers are highly-trained specialists. This is where they differ from commissioned officers. Unlike commissioned officers, warrant officers remain in their primary specialty to provide specialized knowledge, instruction, and leadership to enlisted members and commissioned officers alike. With few exceptions, one must be an enlisted member with several years of experience, recommended by their commander, and pass a selection board to become a warrant officer. The Air Force is the only service which does not have warrant officers; it eliminated the role when Congress created the grades of E-8 and E-9 in the late 1960s. The other services elected to retain the warrant ranks and shifted the emphasis from a promotion process for E-7s to a highly selective system for highly-skilled technicians. There are five separate warrant ranks. Warrant Officers outrank all enlisted members. Commissioned officers are the top brass. Their primary function is to provide overall management and leadership in their area of responsibility. Unlike enlisted members and warrant officers, commissioned officers do not specialize as much (with certain exceptions such as pilots, doctors, nurses, and lawyers). Commissioned officers must have a minimum of a four-year bachelor's degree. As they move up the ranks, if they want to get promoted, they will have to earn a master’s degree. Commissioned officers are commissioned through specific commissioning programs, such as one of the military academies (West Point, Naval Academy, Air Force Academy, Coast Guard Academy), ROTC (Reserve Officer Training Corps, or OCS (Officer Candidate School), called OTS (Officer Training School) for the Air Force. There are also two basic types of commissioned officers: Line and non-line. Non-line officers are non-combat specialists which include medical officers such as doctors and nurses, lawyers, and chaplains. Non-line officers cannot command combat troops as they are specialists and have different jobs and responsibilities.